Representing the fullest expression of our Biologically Appropriate philosophy, ORIJEN’s formulas reflect diets as close as possible to what our pets’ ancestors found and consumed in nature. Our recipes feature unmatched amounts of fresh, raw meat to nourish as nature intended. We use free-run poultry, wild-caught fish, ranch-raised meats, and cage-free eggs that are farmed or fished by people we know and trust, and are delivered directly to our kitchen, fresh or raw, brimming with nutrients and flavor. Nourish your dog as nature intended with ORIJEN’s unmatched fresh regional meat inclusions that mirror your dog’s evolutionary diet, excluding vegetable proteins, and the long lists of synthetic supplements found in some dog foods. Check out the Orijen Dry Dog Food line! Check out the Orijen Dog Treat line! ORIJEN freeze-dried recipes feature rich inclusions of free-run poultry, ranch-raised meat, wild-caught fish, and cage-free eggs to create a superior source of abundantly nourishing protein and nutrient-dense ratios of raw meat, organs, and cartilage or bone, for optimal nutrition. With 90% quality animal ingredients, and up to 58% protein, ORIJEN freeze-dried foods provide all the benefits of a raw diet in convenient dry form. Our freeze-dried foods come in three delicious flavors, Original, Regional Red, and Tundra. Just add warm water and you’ll have a tasty treat that your dog will love. Check out the Orijen Freeze Dried Dog Food line! 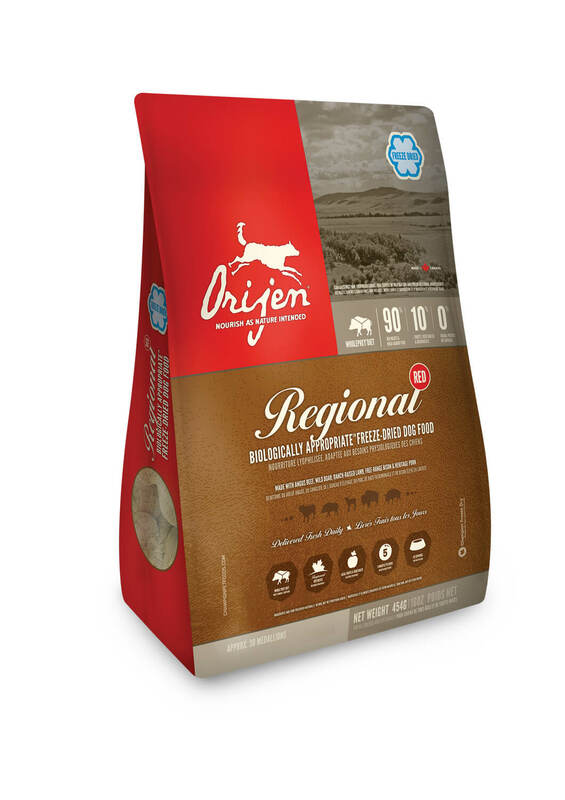 Biologically Appropriate ORIJEN represents a new class of food, designed to nourish dogs and cats according to their evolutionary adaptation to a diet rich and diverse in fresh meat and protein.